At Win-Dor we are able offer you a number of different product warranties designed to give you peace of mind. In addition to warranties on our uPVC and aluminium profiles, for added security we can also provide separate guarantees on our sealed glazing units and furniture and gearing. Win-Dor are also able to offer more general project guarantees upon request for specific materials – a service which is particularly useful for large scale projects. 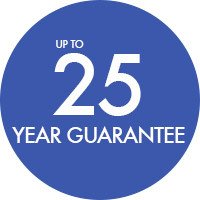 25 year paint guarantee on all aluminium profiles. Warranty offers protection against paint peeling, corrosion and chalking. 10 year guarantee period from delivery date against the effects of fading, rotting and warping. This warranty also extends to window trims and gaskets. 2 year guarantee guarding against failure as a result of reasonable usage and appropriate maintenance. For further information on our product warranties, and details on warranty conditions and stipulations, please download our warranty PDF.